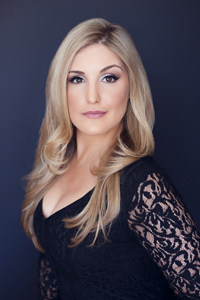 A winner of the 2014 Metropolitan Opera National Council auditions and 2015 George London Award and recipient of a 2015 Sara Tucker Study Grant, soprano Julie Adams is a second-year San Francisco Opera Adler Fellow and alumna of the 2014 Merola Opera Program, where she performed the role of Blanche DuBois in A Streetcar Named Desire. During her studies with César Ulloa at the San Francisco Conservatory of Music, from which she holds bachelor’s and master’s degrees, she performed the roles of Blanche in Les Dialogues des Carmélites, Mimi in La Bohème, Fiordiligi in Così fan tutte, and Lauretta in Gianni Schicchi. ​Other credits include Lia (Debussy’s L’Enfant Prodigue) at the International Vocal Arts Institute in Tel Aviv; Pamina (Die Zauberflöte) at the Music Academy of the West in Santa Barbara; and Magnolia Hawks (Show Boat) and Rose (Street Scene) with the Oakland East Bay Symphony. Adams is a former studio artist with Opera Santa Barbara.